As Mousemobile begins, everything is apparently running smoothly. Planet Mouse in Cleveland is churning out thousands of Thumbtops for mice, thanks to an assembly line of mice technicians under Uncle Fred’s supervision. Jake Fisher is making enough solar blobs to power them all, hidden among the additional solar blobs that he makes in the form of human earrings, belt buckles, eyeglass frames, hair barrettes and similar “light-up” novelties. Joey has gotten wrapped up in Little League baseball, and his team has a good shot at going to the Little League World Series. The Big Cheese, at the Mouse Nation headquarters in Silicon Valley, California, complacently e-mails them weekly to keep them informed of the mice’s progress in spreading Thumbtops to all mousekind, and how the mice are helping to surreptitiously prevent or otherwise deal with climate change; a serious problem for humans and mice alike. Then suddenly the humans in Cleveland get an emergency e-mail from the Big Cheese summoning them to Silicon Valley. The four humans rush to the rescue, only to find themselves on a crazy road-trip with way too many mice. Their journey takes them clear across the country, always just one step ahead of the mysterious enemy. Will the humans save the Mouse Nation, so mice can continue their fight for the health of the planet? ... until about the last seventy pages. 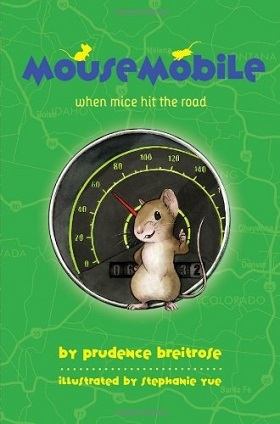 The author and all of the “good guys” promote very heavily the dangers of the Earth’s warming due to human overuse of fossil fuels; but the message does not overwhelm the plot until the end of Mousemobile, where it turns into a blatant faceoff between the Believers in Climate Change (Noble/Good) versus the Climate Change Deniers (Stupid/Evil). Climate change is a real problem, which is presented here much too simplistically just for a “feel good” conclusion. Despite its disappointing ending, Mousemobile is enjoyable for its first 200+ pages. Let’s hope that Breitrose has gotten her message out of her system and will return to telling an imaginative story. She says on her online blog that Disney•Hyperion has just bought Mousenet #3, Mouse Mission, but no publication date is given. Oh my gosh, I am in love with that illustration! Let's hope the "disappointing" ending will be less disappointing to ME. Amazon.com says that "Mouse Mission" will be published on October 6, 2015, and that it will also be illustrated by Stephanie Yue. There will be hardcover and Kindle editions.